Frequently Asked Questions - Greely Sand & Gravel Inc. 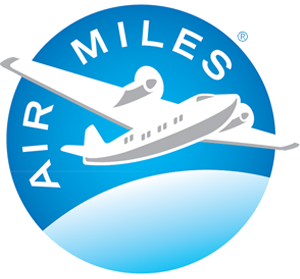 The best way is to contact us at 613-821-3003 where you will always reach a live person when you call. We will be happy to discuss your order with you to ensure you have the right product for your job. You may also conveniently place your order online during the Spring and Summer seasons, from the comfort of your home or office! If you visit our landscape depots to view our products, you are able to place your order in person at our landscape depot at 1971 Old Prescott Road in Greely. Unfortunately, you are not able to place an order in person at our landscape depot located at 4550 Cambrian Road. Click here for photos and further explanations of what a cubic yard looks like. What are the split load sizes? Note: All products are available as low as 1 cubic yard. Can I exchange a cubic yard bag? If we delivered a cubic yard bag of product to your home and you prefer to have it exchanged with a different product, we will charge the difference in price between the products, along with a delivery fee of $109.50. HST is applicable. I have some questions about your cubic yard Gardening Bags. Where can I find some answers? For online orders, you can pay by Visa or Master Card. For orders placed via telephone, we accept Visa or Master Card. If you wish to pay by cash or debit, you can place the order via telephone and then visit one of our two landscape depots to pay with cash or debit card for your pending order. After payment is received, we will be able to schedule a delivery date. For pick up loads, you can pay be Visa, Master Card, debit cards, or cash. 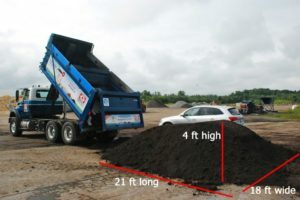 This article defines organic topsoil and outlines the benefits of using organic topsoil, such as Greely’s Topdressing Soil, in your gardens and flowerbeds. 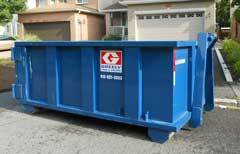 We offer same-day service for our bulk load (by dump truck) deliveries. But keep in mind our regular business hours. If you place your bulk load order late in the day, we may not have the time to get your order to you before we close. Therefore, following day service is available for our bulk load deliveries. Our cubic yard Garden Bags are delivered two business days after ordering via telephone. Please note that all online orders are delivered two business days after the time of ordering. You can choose your preferred date of delivery when ordering online. If you place your bulk order via telephone, we do need someone at home to receive the delivery. This helps ensure that you receive the correct product and it is delivered to the right location on your property. Furthermore, we need your signature authorizing us to drive our equipment on to your property. If you place your cubic yard bag order via telephone, you do not need to be home but must indicate where you would like the cubic yard bag(s) placed on your property by marking the site with an ‘X’. If you place an order online, you do not need to be home but must indicate where you want the product unloaded by marking your driveway with an ‘X’. 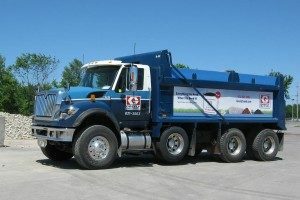 You provide authorization for us to drive our equipment on to your property by submitting your order online and indicating that you agree to the delivery terms. Do you deliver split loads? Yes, we deliver split loads in a single axle, tandem, and tri-axle trucks to one location. This means that you can get two different products in one truck. Our split truck boxes are designed to have a gate in the middle to keep the products separated. The middle gate is locked in place until the driver clicks the release button. So as the truck box lifts, the product at the back of the truck will come out first. 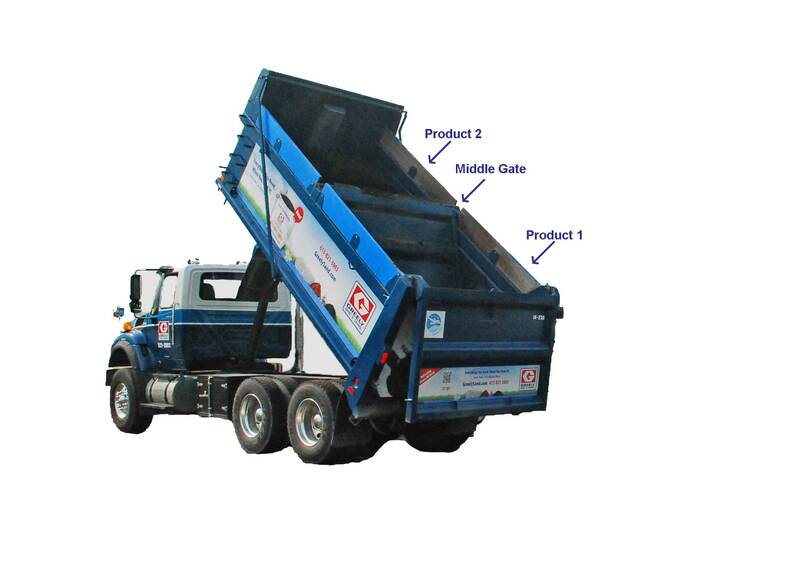 The truck will move ahead, the driver clicks the release button which allows the middle gate to swing, which in turn allows the second product to slide out of the box into a second pile. Refer to below for truck quantities available. Split loading charges apply. Do you deliver products in bags? Yes! Greely’s Gardening Bags are 1 cubic yard bags that are 3 ft X 3 ft X 3 ft. You can receive soil, mulch, river stone, sand or crushed stone in our 1 cubic yard bags. 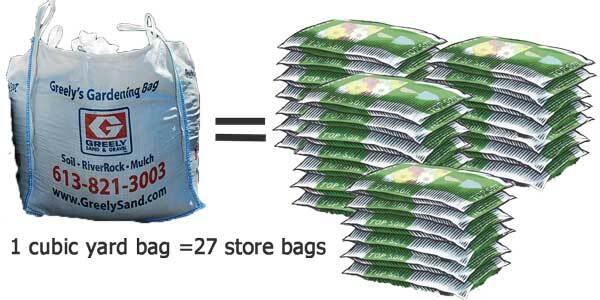 And our Gardening Bags are a full cubic yard, 100% guaranteed! Clean and convenient! We also have half cubic yard bags which are 29″ X 29″ X 28″. Perfect for those small projects! How much space do you need for a bulk delivery? We need a space of 12 feet wide and 15 feet high. The trucks vary in length from 18 feet to 30 feet, which depends on the size of your load. Need more visuals? Click here. What are the load sizes? Note: All products are available as low as 1 cubic yard. 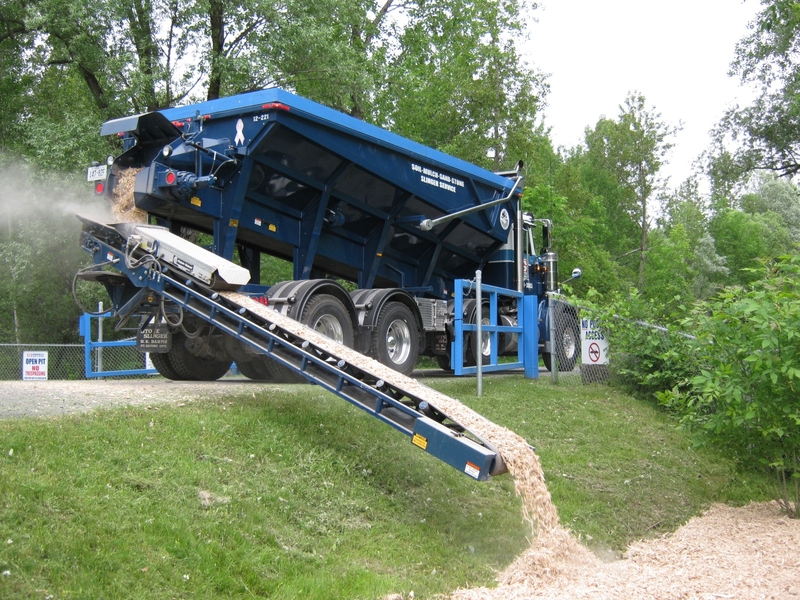 Maximum load size for stone and aggregates varies by product. Please call us for more information. What are Greely's FIVE different delivery options? What are Greely’s FIVE different delivery options? 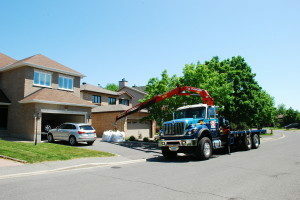 Slinger Service Reduce your labour time and costs – have the truck do the work! Boom Truck Have our Greely’s Gardening Bags, pallets of sod and/or large landscape boulders delivered, using our boom truck with a crane. Pick-Up You can also pick up your supplies at either of our two customer-friendly landscape depots. Unfortunately, only one coupon code can be used per online order. Can I use a promo code for products picked up? Unfortunately, coupons are available for online delivered orders only. Can I use a promo code for orders completed over the telephone? Yes, you can come and pick-up your order. We have two customer-friendly landscape depots located at either end of the city. Both of our depots are clean, safe and easy to use. 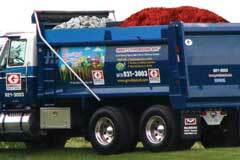 If you have a pick-up truck or trailer, we are able to load it with our convenient 1 cubic yard bucket. Keep in mind if your truck has a cap, we will not be able to load you with our loader; therefore, you would need to load yourself. Please note: Any trucks or trailers being loaded must be safe and meet MTO standards. Please bring a tarp to cover your load before leaving our yard. Our Topdressing Soil™ and Mushroom Compost are also available in 35 liter bags for your convenience at $5.00 per bag (pre-bagged in spring season only). There is a minimum charge of $30.00 for a pick-up truck or trailer loads. Applicable taxes are extra. Click here for directions to our landscape depots. What does picking up my order cost? We’d love to have you come to either of our two conveniently located landscape depots! For price lists for each depot, please click here. Can I look at your products in person? Yes, you are more than welcome to come and view the variety of products we offer. 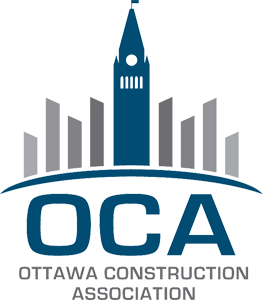 Please visit our landscape depots located in the South-East and West-End of Ottawa. Not all of our products are found at our West-End Landscape Depot. For a list of the available products and their prices, please click here. Can I share a load with a friend? You can share a load (one product) with your neighbour if located in the same block at NO EXTRA COST. Two dumps ONLY. Click here for the locations to our main office and our two customer-friendly landscape depots. What products are available at your West End landscape depot? What type of dye is used to colour your mulch? For more information on the dye used to colour mulch, please click here. Can you provide any Do-It-Yourself (DIY) tips? Be sure when applying mulch to not choke out your plants. Let them have some breathing room by keeping the mulch away from the base of the stems.